Although we are known for being one of the best when it comes to DJ and music production tuition we also know that it doesn't end there once you've acquired your new skills. It takes practice to really perfect your craft. It can sometimes be hard to find a decent space or good equipment to practice with. We have three well-equipped studios across central London (Hoxton, Camden and Soho) with the latest industry standard DJ equipment ready for you to come and practice on for just £40 for 2 hours. Studios can be used for practice or even to record your latest mix. We have the latest in industry standard equipment across our three studios. Below you will find a list of our equipment. 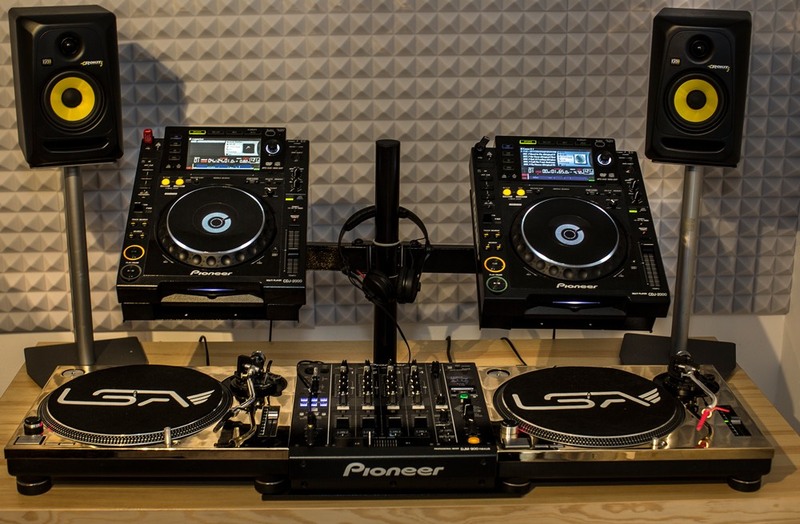 These turntables are available at all 3 of our London studios. Our studio spaces are available to everyone and there will be one of our highly experienced tutors on hand to oversee your practice session. You can alternatively book a single lesson with one of our tutors and take one of our specialist courses in Turntablism, Traktor, Serato or even integrating hardware into a live set up for £80 each. It's really simple to book one of our studios to practice in, we're open from 8am - 10pm 7 days a week. You can book your practice session to suit your schedule. If you're interested in booking one of our studios to practice in then contact us for more information.